The foundational status of the phrase ‘Thus Have I Heard’ within the transmission of Buddhist teachings suggests a primary importance for sound and the act of hearing within this religious tradition. This is certainly the case within the different Buddhist schools of Japan, where the use of sound is fundamental to their culture and rituals. This event will explore a multitude of both modern and traditional ways in which sound can provide a vehicle for experiencing and understanding wide-ranging facets of Buddhist teachings. 13:00. Opportunity to experience Virtual Reality Soundscapes / Sound Installation. Akinobu Tatsumi is a remarkable musician who goes by the artist name of TA2MI, and also happens to be a Jodo Shinshuu Buddhist temple priest. He is as comfortable switching between ritual chanting and beatboxing as he is traversing electronic musical genres in his prodigious creations as a producer. Tatsumi will explore the importance of sound and music for him in his role as a priest, both in a traditional ritual context, as well as in using different forms of music to attract different generations to visit his temple. Clive Bell is a musician, composer and writer with a specialist interest in the shakuhachi (Japanese flute), khene (Thai mouth organ) and other East Asian wind instruments. He has travelled extensively in Japan (where he studied shakuhachi with the master Kohachiro Miyata), Thailand, Laos and Bali, researching music and meeting local practitioners. Clive will be talking about and demonstrating the many Buddhist aspects of the shakuhachi, ranging from the history of the Komuso tradition of the Fuke school of Zen Buddhism, to the meditative effects of playing the instrument. 15:00 Break / Opportunity to experience Virtual Reality Soundscapes / Sound Installation. 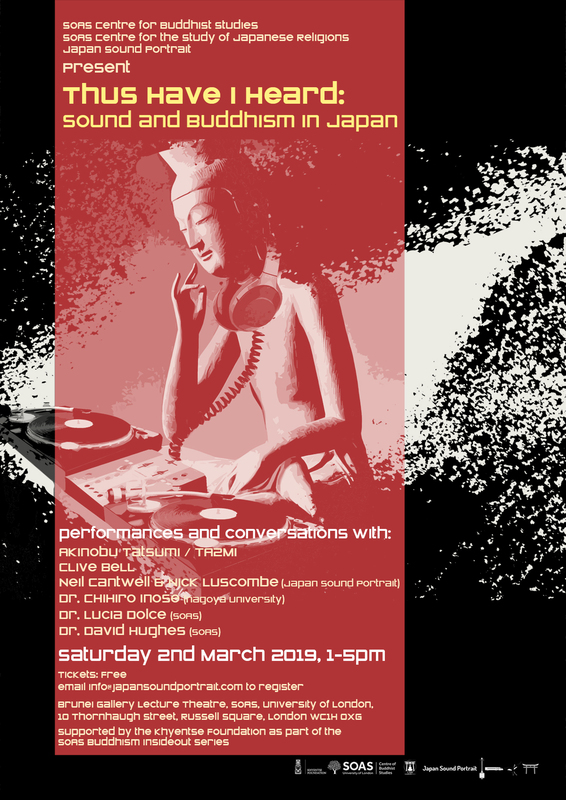 Neil Cantwell is Co-Director of the film KanZeOn, and, together with Nick Luscombe from BBC Radio 3’s Late Junction, they have created the project Japan Sound Portrait in order to explore what representation of the country emerges through focusing on sound. Building on Neil’s time as a Research Fellow at Kyoto’s Shuchiin University, this presentation will accompany a sound installation based on the Diamond World Mandala that is central to Shingon Buddhist teachings, as well as a sound-based Virtual Reality experience of Japanese locations. Analysing these experiments in how sound is able to transform our perception of the visual and the spatial will lead into discussion of related issues that are prominent within another project of Nick’s called Musicity, which commissions pieces of music in response to pieces of architecture, which can then only be listened to at the location which inspired their creation.